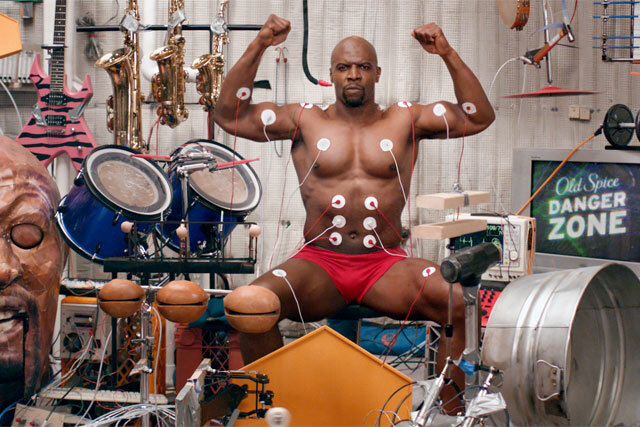 Wieden & Kennedy Portland has created a digital campaign for Old Spice to promote Danger Zone, the brand's latest scent, which features muscleman Terry Crews playing a drum set with his muscles. The video features Crews strapped to a makeshift drum kit, surrounded cymbals, saxophones and a keyboard. He plays a song by moving his muscles, which are attached to a set of pads on his pecks, arms and abdomen that are hooked up to the instruments. The video then turns into an interactive experience in which consumers can control Crews' muscles and the sounds he produces through their own keyboard, and then record their own version of the song for Danger Zone. Consumers can watch the video and create their own here. The video was created through a collaboration between Wieden & Kennedy Portland, video platform Vimeo, director Tom Kuntz, Mackenzie Cutler and production company The Mill. Vimeo has built a custom experience and a creation tool for Old Spice that can be embedded into all of the brand’s social media channels. Several variations, which can be seen on the Old Spice Muscle Music channel, have been recorded and uploaded by consumers. Crews' work as part of Old Spice’s advertising includes the campaign for Odor Blocker, which started in 2010.